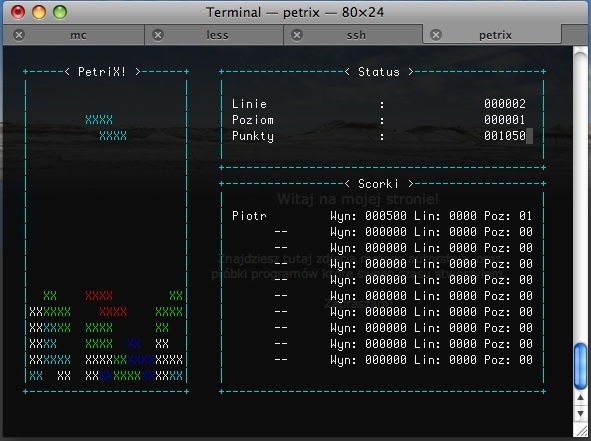 A tetris game that works on Unix operating systems (such as Linux, Mac OS X) in console mode. The archive contains binary code (dynamically linked, so recompilation will be necessary) and the source code in C++. So, after recompiling, you can run the game under almost every unix/linux flavor that has the ncurses library and the gcc compiler. The purpose of the game was to become familiar with the ncurses library, which allows a lot of control over the screen and keyboard in the unix text mode. Start the game in your browser by clicking here! 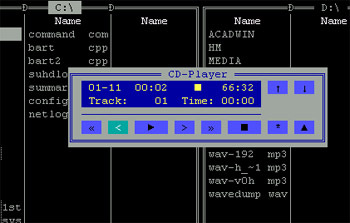 The program for Windows 95 used to play CDs in cdrom readers, there was also an option to rip tracks to WAV files, you can select songs to be ripped, and several destinations where you need to save (not big /then :)/) WAV files. It was written in Borland C++ 5.0. The reason for writing this program was the desire to learn about Win MCI, which allowed control over multimedia in Windows. 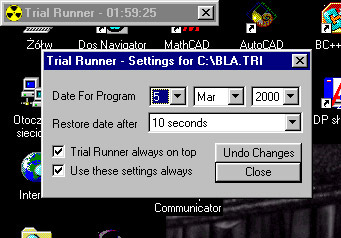 The program was left a bit unfinished, the option to edit disc and song names has not been implemented due to lack of time. This is a tetris game whose multi-platform engine was written in C++. To provide a graphic interface the Borland C++ 4.52 was used. The aim of writing the game was to find out whether it is difficult to program such a game, as well as to check how hard was create applications graphically sophisticated under Windows. Resident program (3KB only in memory) for DOS used to play CDROM discs. It was written in assembler in 1997. I could not find this type of program online, so I decided to write it myself. The advantage of the program is the small amount of memory it occupies and the fact that it could be activated while working with other programs working in text mode. It was very useful and easy to use. In the archive, apart from the executable program, there are also its sources in the assembler, as well as an example source file in Pascal to demonstrate the way of controlling the CD drive. Ten program jest wynikiem pozytywnego odzewu jednego z naszych czytelników. Pod nazwą kryje się wszystko. CD Player to rezydentny odtwarzacz płyt kompaktowych. Po uruchomieniu pozostaje niewidoczny do momentu przywołania go za pomocą kombinacji klawiszy. Na uwagę zasługują jego wymagania dotyczące pamięci. Zajmuje niewiele ponad trzy kilobajty, co dla środowiska DOS jest sprawą niezmiernie ważną. Obsługa panelu odtwarzacza nie powinna sprawić trudności. Dostępne są standardowe funkcje, identyczne jak w zwykłym odtwarzaczu, a ponadto możemy płynnie regulować głośność dźwięku. Jeżeli spędzasz dużo czasu np. : przy programowaniu, nie zapomnij wrzucić do napędu ulubionej płyty. Nazwa: cd_play.zip Dł. : 25 kB Śr. : DOS "
A resident program for DOS written in assembler used to kill unruly programs. Just press the appropriate key combination to kill the currently running program. It was another experiment related to writing residential programs for DOS, as well as gaining experience in assembler 80x86. In the archive below there is EXE version and the source code in the assembler. 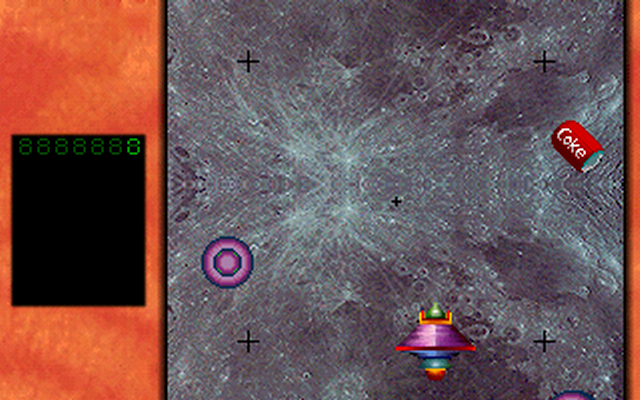 A Shoot 'em up game that works under DOS in 320x200 graphics mode with 256 colors (!). It was written in Borland Pascal 7.0 + assembler in order to: accelerate double-buffering, to provide direct mouse + keyboard support (support for simulating keystrokes). Each of the sprites could have been animated (have several frames played in loop). 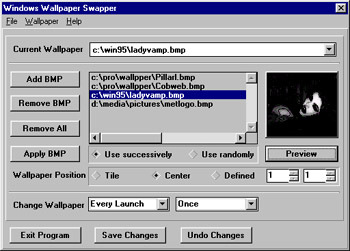 The game was also equipped with its own graphical level editor with mouse support. The game unfortunately remained unfinished, about 10% missing for completion. In general, to complete the game, some bugs related to saving and/or loading game resources along with levels should be corrected (probably bad or null pointers :). The source and binary version of the game is available in the archive below for download. The earthworm game operating under DOS in a 640x480x16 graphics mode with "fancy" graphics. It was written in Borland Pascal 7.0. It was a highly instructive programming lesson. Thanks to this I also got to know the possibilities of direct programming of the graphics card. The result is a game that many people like to play even today :) (check out the link below). Unfortunately due to the defective CRT library, the game could not be launched on newer computers (> Pentium 200 MHz (!)). Start the game in your browser (yes, that's right!) by clicking here! 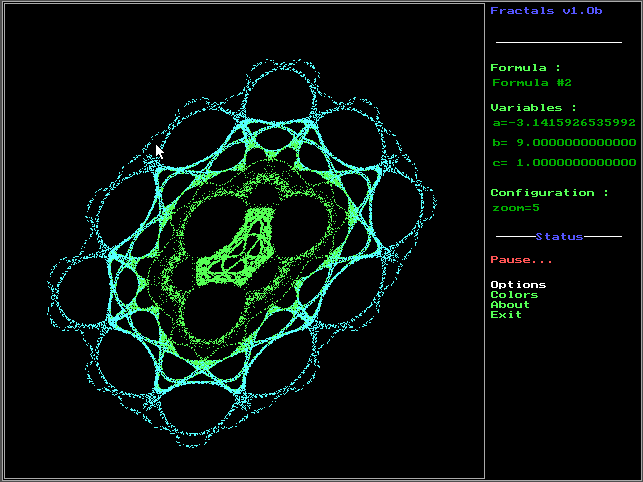 The Fractals program presents several fractal demos, including Koch snowflakes, Fern, fractal trees. 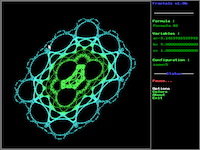 It was possible to change the basic parameters of the fractal pattern. The program enabled work in 640x480x16 resolution with mouse support (!). To download, next to the executable program, there is also a source in Pascal. Run the program in your browser by clicking here! Resident program (only 2KB in memory) for DOS used to convert DEC/BIN/HEX values to DEC/BIN/HEX. The advantage of the program is the small amount of memory it occupies and the fact that it could be activated while working with other programs working in text mode. The program calculated the amount of space that is lost on allocations in FAT16 filesystem. It was most noticeable on large partitions. I wrote it in Pascal as I wanted to find out where the precious disk space disappears.